I used to dance a lot when I was in my twenties. Before you get the “right” impression, with dance I mean the kind Afrikaans speaking white South Africans do over weekends and festivals. We have different terms for this kind of dance. Langarm – meaning long arm, referring to the style of dance. 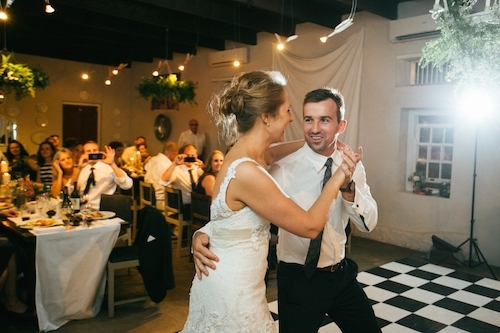 Skoffel – meaning to shuffle. Sokkie – Afrikaans for sock. Removing your shoes and dancing on your socks is quite common during these dances. My first dance (in public, with someone other than my mother), was in 1995 with Phelia du Toit. We both were in grade 8 at the time. I remember the song, it was American Music by Violent Femmes. Luckily there was nothing violent about Phelia. With her right hand in my left, I looked down towards our feet, totally unsure which one to move first. I looked back up at Phelia and said: “I’ll start with my right and you just do the opposite of what I do”. Needless to say, it was a disaster of a first dance. Our feet got tangled somewhere between “do you like American music?” and “I like American music” which basically sums up the lyrics of the song. For us, it wasn’t “sakkie-sakkie” it was struggle-struggle. Our high school is still known for its “sokkies”. In an environment where everyone you look up to can dance, you tend to power through those early embarrassments. Eventually when I started studying at Stellenbosch University, I was able to hold my own with any girl at any “sokkie”. This takes a lot of learning, observing, practising, apologising, forgiving, biting on lips and growing tougher toenails. It takes time. Any person worth his “sakkie-sakkie” salt, will know that you have to react quickly once you’ve skipped a beat, otherwise you end up standing in the middle of the dance floor looking rather sheepishly at your partner, trying to find the right que to enter the dance again. The best way to find your partner’s step again, it to take a quick double-step. Not a big one though, just a small extra step or two that will get your feet back in sync again. Others prefer to pause a moment, listen and then take the next step. Others try to ignore the misstep, but end up like a derailed train somewhere between the bar and the bathrooms. My journey with Jesus reminds me a lot of my dancing days. Isn’t there a song that says God is a DJ and life is the dance floor? Well, without falling into the never ending mushy pit of teenage love metaphors for Jesus, allow me to play around with this metaphor: Jesus as my dance partner. 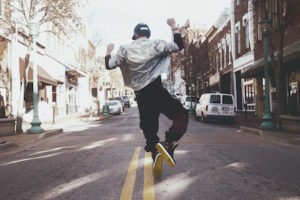 A friend of mine, Niel Knoblauch recently wrote a beautiful piece on the body of Christ as a dancing body. He writes that worship is to dance before and with God. This dance is best performed with others. This metaphor is not unique in the Christian imagination. C.S. Lewis used this metaphor in a number of his talks and writings. In chapter 26 of Mere Christianity, he explains that God is a dynamic, pulsating kind of dance. The Father, Son and Holy Spirit dances in perfect union with each other. In theology we call this “Perichoresis”, meaning “rotation” in Greek. As early as 390 AD the church father Gregory used a relating verb describing the relationship between Christ’s divine and human nature. According to Lewis, this God-dance is playing out in the life of the Jesus-follower. We dance to the music on which God is dancing. Lewis uses this metaphor to highlight discipleship. “Every Christian is to become a little Christ”. Eugene Peterson also hints in this direction. His translation of Jesus’ famous call to discipleship in Matthew 11 is a dance with words in itself. We are the dancing disciples. We are like those little ballerinas who dance on the same stage as the prima ballerina. Our movements reveal how much we still have to learn. I often lose the beat when dancing with Jesus. He’s got moves that I just can’t do. He dances to tunes that I struggle to hear. Discipleship is allowing him to lead. The better you get, the less you look down at his feet and more at the way the dance floor constantly changes. You become a dance partner, someone who contributes to the dance. You start to bring your own flavour to the dance. Grace as Jesus never failing ability to take a double step or a quick pause to allow me back in the dance again. Taking time out to try to reconnect with Christ. Living gracefully towards the partners in my life who stepped on my toes, helping them to dance with me. May you grow in God’s dance. May your toenails toughen up while your steps become lighter. And may you always get back in once you’ve skipped a beat. Married to Mareli. Lives in Wellington, Western Cape. Tells stories for a living. Makes stuff from leather. Tries to swear less. Bakes the odd bread every now and then. Firm believer in the Monday evening barbecue. Drinks wine. Tend to whistle old church hymns. Currently reading the Gospels, again. Beautiful, Fourie. And shot for the mention! I love how this image sheds a graceful light on “miss-steps”, as that unavoidable awkwardness that accompany our pursuit of a relationship with Jesus (and the beauty of moving with Him). Profound metaphor! To me, dancing is the most intimate public connection. My personal dance metaphor would be linked to doing the Argentenian tango in my life with Jesus – the physicality of the steps combined with deep felt emotions. Jesus involves us in His plans and allows us to feel deeply all the way through our dance with Him.